« It’s officially official, part deux: Looks like I’ll be at Anime Expo as well! Well, those of you who have been particularly observant may have caught me making vague references to this on Twitter or Facebook, or on some of my past video podcasts. And if you were paying attention to last week’s audio episode, you almost certainly heard me announce this. Well, now it’s officially official: I will be putting on a workshop at FanimeCon!! This year’s FanimeCon is shaping up to be yet another awesome event, with guests such as musicians LM.C and Haruko Momoi (who totally rocked my socks off at last year’s FanimeCon – I’m so glad she’ll be returning! ); Daisuke Ishiwatari, creator of the Guilty Gear franchise; Hiroyuki Yamaga, one of the founding members of a little anime studio called GAINAX; and many others. Aside from the usual con happenings (AMVs, Masquerade, a pretty happening dealer’s room, gaming, etc. ), FanimeCon also features a refreshingly broad lineup of panels covering a wide range of topics, including cosplay, gaming, entertainment, gatherings and debate, how-to/demo, manga, webcomics, music, working in the industry, and many more. Well, yours truly will be responsible for one such panel, and if you’ve ever wondered how I put together this little dog and pony show we call Otaku no Podcast, you might want to stop by. 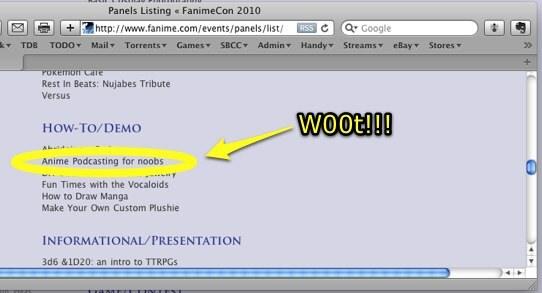 My workshop, “Anime Podcasting for n00bs” is currently scheduled for Sunday, November 30, at high noon. So far only the preliminary schedules have been drawn up, so this time and date may change; also, since it’s just a preliminary schedule, I don’t yet have a room assignment. I’ll definitely let you know when I find out more. While I’m at con, I’ll also do my best to bring you some audio and video highlights from the event — and yes, I’ll actually try and get you some real interviews for a change! So be sure and keep an eye on the website and the podcast feed come Memorial Day weekend. Bandwidth and technology willing, I’ll be posting as much stuff as I can before collapsing in an exhausted quivering heap at the end of the day. FanimeCon will be held on Memorial Day weekend, Friday-Monday May 28-31, at the San Jose Convention Center in downtown San Jose, CA. For more information, links to pre-register, etc., check out their website. 2 comments to It’s officially official: Come see my panel @ FanimeCon!